Five weeks from my due date for my daughter, Liam got a stomach bug. I changed diapers for two days and then woke up on the third day in agony myself. As anxious as I was to meet Sylvi, I wasn’t thrilled about it involving me in the condition I was in. By the second day of my illness, I was having regular and strong contractions every time I ran to the bathroom and I was starting to get scared. I knew that as weak as I was, giving birth was not a wise idea. My husband called our midwife while I sat in the bathtub sobbing in between episodes of vomiting. She told us to get some Slippery Elm capsules and take two right away. Before I went to bed that night, I took two more and settled in for a peaceful night. The next day I was back to my normal, very pregnant self. I’m not a medical practitioner or an Herbalist, but I have done my research. Believe me: if you take something in desperation and then feel as though you’ve been miraculously healed, you’d want to do the research as well. Slippery Elm is a just a simple tree that’s native to North America, but its healing effects are very important. The first English settlers noticed that the Native Americans used it as a bandaging method, a method of food preservation and as soothing gruel for ailing people of all ages. They then discovered that by mixing the bark with hot water, it took on a slippery consistency and so it was named. Slippery Elm bark is used to treat irritation throughout the body by increasing the mucus production in the tender flesh of the digestive and reproductive systems. The mucus coats the inside of the intestines and soothes the irritation that causes diarrhea, colitis, gastritis, nausea, heartburn and peptic ulcers to name a few of the ailments it can relieve. In my case, it soothed my intestines and stomach so I’d stop having diarrhea and vomiting every 20 minutes. Since my first introduction to Slippery Elm, I’ve made it a regular part of my medicine cabinet. I continued taking the capsules for a few days to give my intestines an extra chance to heal, but in the months following I’ve only ever used it a few other times. Ill-advised binges on really spicy or greasy foods seem to be my downfall, but I’ve not had to reach for Tums, Imodium, or Pepto! My father and my husband are now also big believers in it as well, each from their own experience with it. Recently, I restocked my natural medicine cabinet and made sure that I had plenty of Slippery Elm. For the last three years in a row, we’ve had either the stomach flu or an episode of rotavirus; this year I wasn’t about to have it happen again. Wouldn’t you know it, not even the tiniest bit of indigestion hit our house this year! No matter—I’m ready the next time tummies start rumbling! 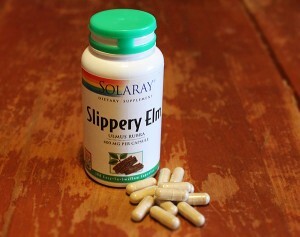 Since Slippery Elm is a food product, there isn’t an upper limit on how much you can take. As an adult there are recommended doses, but to use for a child please consult a knowledgeable practioner. Because it coats the mucous linings of the body, some medications may not be able to absorb as they are intended. I have used a slippery elm and honey mixture for wounds/burns with very good effect. Historically, slippery elm was used as a nutritive and alimentary canal healer for the very young, very old, and/or very ill.